I’m generally not given to making effusive statements in boat tests – or anywhere else for that matter – but this Aussie-built plate alloy sportfisher is a bloody beauty. There’s really no other way to describe it. In short, if you’re after a serious offshore fishing machine that’s light to tow, rides well and easy to look after, you’d be mad not to check this rig out. OK, we’ve got all the hyperbole out of the way so let’s get down to business. Fisho tested the 730HT in Sydney Harbour with Alan Blake from Blake’s Marine. Remnant swell from a recent southerly blow provided chop and slop around the Heads, allowing us to get an idea of how the boat performed in what could be described as average, but fishable, conditions. 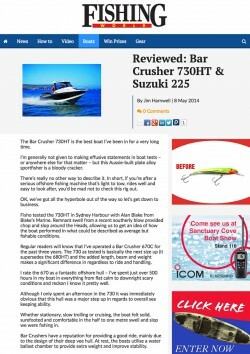 Regular readers will know that I’ve operated a Bar Crusher 670C for the past three years. The 730HT as tested is basically the next size up (it supersedes the 680HT) and the added length, beam and weight makes a significant difference in regard to ride and handling. I rate the 670 as a fantastic offshore hull – I’ve spent just over 500 hours in my boat in everything from flat calm to downright scary conditions and reckon I know it pretty well. Although I only spent an afternoon in the 730HT it was immediately obvious that this hull was a major step up in regards to overall sea-keeping ability. Whether stationary, slow trolling or cruising, the boat felt solid, surefooted and comfortable in the half to one metre swell and slop we were fishing in. Bar Crusher boats have a reputation for providing a good ride, mainly due to the design of their deep vee hull. At rest, the boats utilise a water ballast chamber to provide extra weight and improve stability. Apart from the cabin configurations and the obvious size increase, the main difference between the two hulls is that the 730 features a self-draining deck. In my view, one of the best things about the 670 is the 800mm internal freeboard – you really feel ‘inside’ the boat, especially when jigging or fighting fish in pitching seas. I’m 1.83m tall and the wide gunwales of the Fisho Bar Crusher come up to my mid thighs, allowing for safe and easy fishing. The higher deck of the 730 (to allow for drainage via the rear scuppers) means internal freeboard is 690mm. This 110mm difference between the two hulls was noticeable, but not as much as I initially expected. I found I could still easily and comfortably brace myself against the gunwales. Importantly, the available freeboard meant my knees were below the edge of the gunwales. Someone really tall might suffer the odd whack to the kneecap in this boat, but the average fisho should have no issue effectively fishing around the entire deck. Once I’d satisfied myself on the internal freeboard issue, the next items on my agenda were to check out the cabin and then the rear deck. I’m a huge fan of semi-enclosed hard tops as featured on the 730HT. These cabs provide almost complete protection from the elements and make travelling in messy seas and poor weather much more pleasant and comfortable than in more open boats. While centre consoles might be fine for anglers in the northern half of the country, most of the offshore fishing in southern Australia involves plenty of water in the form of spray, rain and even waves coming onboard – given that fact, I’ll take the protection of an enclosed hard top over a centre console or cuddy cabin any day! The cab on the 730 offers plenty of protection yet you don’t feel ‘closed in. There’s loads of ventilation and the high roof and sides create a nice airy feel. While I’ve got full clears on my 670C, there’s nothing like the protection offered by toughened glass and an alloy roof. Blasting through the chop in the dying southerly breeze saw plenty of spray hit the windscreens – but none of it landed on me, which was great! There was no sounder or GPS fitted to the test boat – Alan Blake prefers to let customers choose their own electronics. As I saw it, there was sufficient space on the dash for either a 10 or 12-inch combo or for two separate eight-inch units. The test boat featured twin Garmin GMI 10 units for engine data from the grunty Suzuki 225hp on the transom. Analogue gauges are an alternative if you want to save a few bucks. The engine controls were helm mounted for easy operation and spacious side pockets on either side of the cabin provided plenty of safe storage for phones, wallets, drink bottles and so on. The test 730HT had GME VHF and 27 meg marine radios roof mounted within easy reach of both skipper and crew. The boat featured basically the same pedestal seats with internal tackle box storage as on my 670C. These are fantastic and allow all sorts of tackle – lures, terminals, hooks, jig heads and so on – to be easily accessible. Another interesting aspect of the 730HT was the internal cabin layout. Unlike my 670C, the padded squabs of the 730HT’s fully-lined cabin were flush with the floor, with a lip preventing water intrusion. The test boat featured full infill squabs with loads of storage underneath and yet more storage in side pockets. A clear hatch provides natural light and ventilation. You and your better half could overnight in here quite comfortably, and there’s the option of a Porta Potti if required. As with all Bar Crushers, easy access to wiring and fuses is available via a sliding hatch behind the helm. A quick inspection while in the cabin revealed the usual neat, organised and super-efficient wiring job that I’ve come to expect from the Bar Crusher factory. The cabin entrance can be optioned to allow for the inclusion of lockable panels for privacy and security. Designed and built as a serious offshore fishing boat, the 730HT features plenty of deck space. Interestingly, this boat boasts more usable fishing room than the flagship of the Bar Crusher fleet, the massive 780HT. I’d have no issues fishing at least four up in this boat. Even with a big icebox amidships and assorted tackle, there’d be plenty of room for active sportfishing in the form of jigging, popping or spinning. Gamefishing would be a breeze with well-positioned cast alloy rod holders, sturdy rocket launchers and yet more rod holders atop the bait board. These rod holders are all fitted as standard. The wide gunwales are strategically topped with non-slip plastic pads. These allow for safe movement around the hull when cleaning the boat and if boarding or alighting via the gunwales. When trolling offshore I often stand on the gunwales and hang onto the roof of my boat to look for signs of birds or feeding fish – the standard issue non-slip pads provide sure footing, even in a bit of a sea. The test boat featured a variety of optional extras including a Stress Free anchor winch, Hella flood lights, a deck wash, trim tabs, a windscreen wiper and tube matting for the checkerplate floor. Of these, I’d suggest that all but the matting are essential add-ons. While we’re at it, I’d probably go for twin windscreen wipers as opposed to the single one fitted on the test boat. Other than that, the 730HT, like all Bar Crushers, comes standard with just about everything else you need. This includes hydraulic steering, dual batteries, a plumbed livie tank, a bilge pump, deck lights, nav lights, a Sarca anchor and a kill tank. Add these features to the options above and all you need to finish off what I reckon is an outstanding offshore fishing platform is a set of outriggers and maybe a downrigger, plus your chosen marine electronics. Bar Crushers come fitted to custom-built Easytow boat trailers. The test boat rode on a twin axle gal trailer with a Dexter brake system and high-quality Fulton winch and jockey wheel. I’ve run two Easytow trailers over the years and I personally wouldn’t even dream of towing a Bar Crusher on anything else – Easytows are outstanding trailers and make towing, launching and retrieving a breeze. Bar Crusher trailers also come fitted as standard with the nifty Bar Catch device which allows for easy drive-on/drive-off launching and retrieving. Custom-made Easytow alloy trailers are also an option. As tested, with a full tank of fuel, Alan Blake said the 730HT had a tow weight of about 2400kg. This makes the boat easily towable by any of the current range of medium to large 4WD wagons and dual cab utes. For instance, my 2012 model Ford Ranger is rated to tow 3500kg so the 730HT, while a hefty package, would pose no problems at all… if, that is, it fitted in my shed! The 730HT is rated to 250hp. Having experienced the neck-snapping performance of the test boat’s 225hp Suzuki four-stroke, I’d argue that a 250hp donk would be absolute overkill. The boat got on the plane at 2900rpm and cruised very comfortably and efficiently at the 4000-4500rpm range. The 730HT carries 280 litres of fuel so you could expect plenty of cruising range with today’s modern four-stroke and DFI engines. As you will no doubt have realised by now, I reckon the 730HT is a real Fishing Weapon! It’s big and solid enough for serious offshore fishing, yet isn’t overly heavy to tow or power. It cleverly combines protection from the elements with class-leading deck space and standard features. Like most alloy boats, it’s easy to clean and look after. While not cheap, it seems to be more cost effective than many locally produced seven-metre class fibreglass boats, while offering similar ride quality and features. Last but not least, the Bar Crusher 730HT is proudly Australian made. What’s not to like?